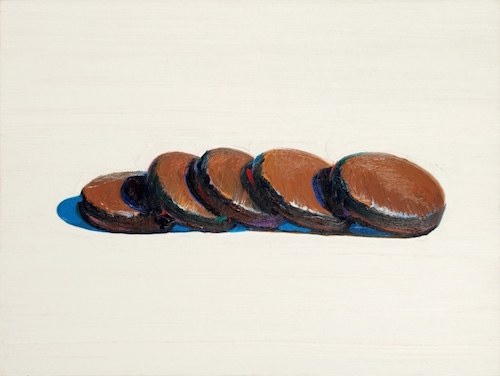 Wayne Thiebaud, Five Chocolate Cookies, 1989, oil on canvas board mounted on plywood, 9 x 12''. Sunglasses, ice-cream cones, nudes, bolt cutters, and, of course, layer cakes are just a few of our favorite things depicted in this airy, career-spanning sampling of Wayne Thiebaud’s work. The sophisticated whimsy of the painter’s realism is reflected not just in his choice of charming subjects but also in his meticulous renderings of them. Via his multicolored outlining technique, which the artist refers to as “halation,” the works are imbued with a subtle Kodachrome radiance. And up close, one finds a fanciful mini-sunset at the edge of each object. In the magnificent and never-before-exhibited painting Five Chocolate Cookies, 1989—which is not much bigger than a sheet of loose leaf paper—Thiebaud defines a row of dark glossy disks (Thin Mints?) with confetti-like marks of crimson, tangerine, and turquoise. White paint, meant to suggest a pristine plate or a Formica countertop, arcs around the cookies and moves in velvety horizontal strokes, like an infinite plane of vanilla buttercream. While the artist is best known for his perfect takes on the post–World War II American quotidian, he frequently branches out. In the surreal Up Street, 1993, multiple lanes of traffic take a sharp vertical detour, as if on a roller-coaster track, and a funny palm tree teeters at the top in the distance. Mound and Cloud, 1972, is an otherworldly landscape in which a meringue-like puff floats in a bright blue sky above a snow-topped mountain with a cliff face of what looks like rainbow-flecked ganache. An adroit and subtly trailblazing literalizer of the frosting/oil paint parallel, Thiebaud, as the range of this lovely exhibition proves, can apply his signature unfussy delicacy to anything at all.